Just as having a quick shower is effective, sometimes a long luxurious soak is, by far, more pleasurable. Or a quick sandwich vs. a proper sit down lunch. Though we can’t always spare the time to enjoy these simple pleasures, when we do, we really ought to make it special.There is something ceremonial about sitting down and having a proper cup of tea poured from a pot into a real cup. Choosing a teapot can be an important decision, and a very personal one. Allegedly,the founder of modern utilitarianism, the philosopher Jeremy Bentham, placed such importance on his teapot that he named it Dickey. That’s a pet that you can love for life. There is a cult in Malaysia that actually worships a giant teapot because they believe it symbolises “the healing purity of water”. So, you see, teapots are important. With so many shapes and sizes to choose from where does one begin? I suppose really, you must firstly think about the size. You can get yourself a teapot just enough for one, known as a bachelor pot, or one large enough to serve eight or more. Bearing in mind how heavy these larger pots might be, I would perhaps suggest when serving a large group, that it is probably better to have two smaller pots or refill one that serves four. Once you have decided on size, you should then consider style. Teapot shapes are varied but most stick to a theme. The best shape for optimum infusion is round and, yes, short and stout. Now, round can mean just that, or any variation thereof, such as pear shaped or bell shaped. This shape allows the tea to brew properly and maintains the heat better than, say, a tall one might. The materials used are varied as well. For day to day use I would say most people would probably choose porcelain but other options are available and also used. For the purposes of this post I am going to choose silver because if you are wishing to impress your guests, or simply please yourself, silver is always an elegant option. Silver has some advantages as a material and therefore makes choosing one a viable option. Firstly, silver, owing to its natural properties as a metal, means it heats up quickly so there is no need to warm the pot beforehand. Also, silver teapots are very durable. Should you drop your teapot you don't need to worry about chips or breakages. This means a silver pot is ultimately longer lasting. There was a tv makeover programme (Changing Rooms with Linda Barker) here in the UK in the 1990s where they redecorated a room for someone to display their china teapots, and upon presenting the newly decorated room to the woman, the whole display came crashing down smashing her precious collection into thousands of pieces. I’ll bet she wishes she was collecting silver! Linda Barker recalls that fateful moment. When selecting your teapot remember that, as a metal, silver does become hot, so choosing a pot with feet means it can be safely placed on a table or sideboard. You will often find that a teapot might require a stand to protect your fine furniture. Also note the handle. If a teapot were to have an all metal handle that would soon become too hot to handle. Look for a teapot with a wooden handle or one where they have inserted 'breakers', small bands of bone or wood, to prevent the heat from travelling through. Bone breakers to prevent heat passing through the handle. The spout should be located a ways up the body of the pot so as not to disturb the leaves. Of course, these days where bags are often used this is of less importance. Ideally, you want the mouth of the spout to be level with the top of the pot. Though dripping seems a natural occurrence, the advantage of a silver spout is that the thinner the spout the less likely it is to drip. In the 1920s you may have come across a buttery underside as it was a trick of the time to put a smear of butter under the spout to prevent drips.I have yet to try this method because, in my experience, we have tested dozens and dozens of antique silver pots and they really don’t drip. 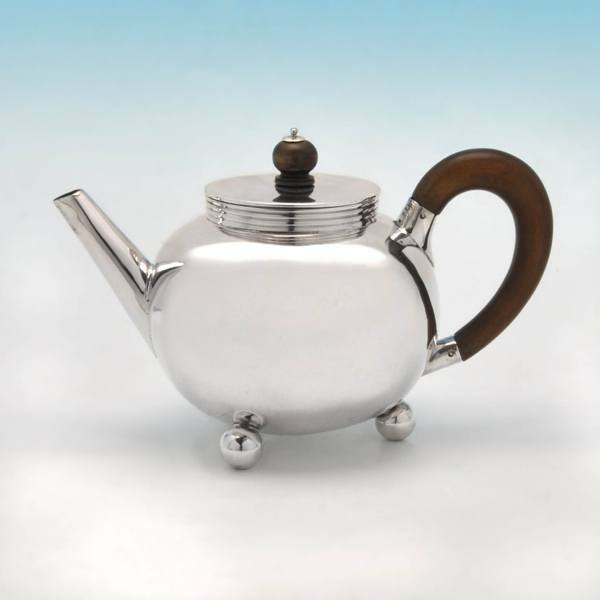 As most silver teapots tend to have hinged lids,regardless of the angle you pour from, the lid will remain in place. On top of the lid you will find the finial. This is the little knob and is most likely to be made from bone or wood. The advantage of this is that the heat won’t travel to it. The lovely thing about a silver teapot is that once your tea is finished and your guests have gone you can leave your pot out and on display to be admired and appreciated by you and anyone else who sees it. 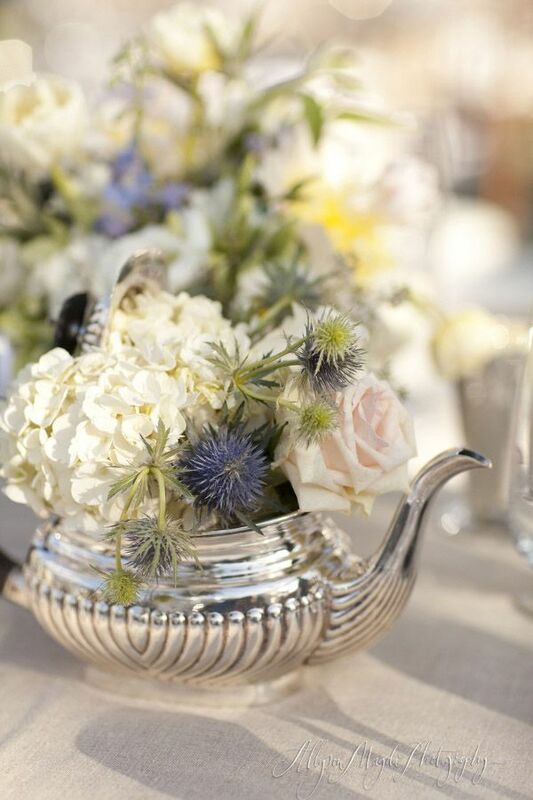 In fact, the beauty of a silver teapot is so admired you will find a trend these days of reusing them for flower displays in gardens and at special occasions such as weddings and other fashionable dos. So really, once you take all the basics into consideration, the only thing left to do is decide which one speaks to you. Please check out our Pinterest board for some inspirational tea time ideas, but before you do, go and put the kettle on. This scene from Downton Abbey shows an antique silver tea service.Here at I.Franks we were lucky enough to be involved with them, providing much of the silver used on the show.